In my over fifty years of working with immuno-depressive conditions such as these and others, I too, have found mal-digestion and mal-absorption to be a leading symptom of many illnesses. I also discovered that the cause for this gut malfunction to be a basic deficiency throughout the body of systemic protein. This deficiency presents as one of its major symptoms, a gut in various stages of degradation. The lining of the gut can be inflamed, thickened, and porous, it may be creating polyps, lesions, or pits in the walls. The absorption cells of the small intestine may become flattened, thick and resistant to allowing nutrients to pass through. These symptoms can be bad enough to present as Crohn’s disease, ulcers, or Fibromyalgia or mild enough to just cause bloating, mild fatigue, or allergies of all kinds. In treating these illnesses, I found that replenishing the body’s stores of systemic protein would allow the gut to heal and rebuild itself. In order to make this possible I had to patent a very specific essential amino acid blend known as Platinum Plus Essential Amino Acids. However, in cases where the gut degradation has gone on for a significant period of time the healing process can take a long time, so extra measures should be taken to speed the healing. The protein deficient gut has several problems: it cannot make the enzymes needed to completely break down foods, it does not have the protein available to deal with enterocyte turnover and it cannot make the immune system in the small bowel (the Peyers patch route)that effectively protects the body from harmful foreign particles of food. This specialized immune system of the gut mucosa keeps the harmful particles from reaching the blood and circulating through the system. When protein deficiency keeps the body from maintaining this immune system, the food particles act as irritants to the gut mucosa, causing inflammation. This will cause the tight junctions between the absorption cells of the small intestines to open and allow more of the harmful particles through. This condition is mal-absorption. Crohn’s, colitis, and IBS are all examples of severe mal-absorption. Aloe is also an extremely rich source of the essential sugars. In a process is known as pinocytosis, these sugars are not broken down like other sugars, but ingested whole from the gut, appearing unchanged in the bloodstream. Once in portal circulation, the sugars become immune system enhancers. Some of the polysaccharides stay on the gut wall and forming a protective barrier against undigested food particles, helping to protect the system from “leaky gut”8 while Platinum Plus works to heal the gut wall. Aloe also contains anthraquinones, compounds found only in the latex layer of the aloe leaf. They help with gut absorption, kill bacteria and viruses and have pain killing properties. They also have gut stimulant properties and the latex is often used to make laxative tablets. Aloin, barbaloin, aloe-emodin, and aloectic acid, are a few of the anthraquinones contained in the latex layer. Use of the latex layer of aloe leaf should be done with care as overuse is associated with lowered electrolyte levels, most particularly potassium.9The latex layer is found directly next to the outer wall of the leaf, it is distinct from the aloe gel found in the center of the leaf and is not used in Sea Aloe Gold. Oral aloe has been used successfully in studies with diabetics showing that it normalizes blood sugars.14 In 1994, studies showed that orally administered aloe vera speeded up wound healing in rats (topically administered aloe delayed deep wound healing).15 Orally administered aloe vera has also been implicated in the healing of conditions such as asthma, HIV, arthritis, and many others. Sea Kelp is a rich source of mineral salts: iodine and chlorides (Na, K, Mg), hydro and liposoluble vitamins (A, C, B1, B2, PP, K, B12) and trace elements (Mn, Fe, Cu, Co, B) . Iodine is an essential element involved in protein metabolism in the body. If the body is iodine deficient, protein synthesis will be hampered, leaving the body in an immunodeficient state. Also, the thyroid needs to have at least 60 mcg. of iodine daily in order to make adequate amounts of thyroid hormone. Iodine is stored in the breast tissue, gastric mucosa of the stomach, and sweat glands. According to Dr.Jorge Flechas MD, iodine deficiency is prevalent today as the soil no longer provides enough in the plants, we no longer put it into milk and bread, and the amount we put in table salt is not enough to meet our requirements. Iodine deficient breast tissue tends towards fibrocystic breast disease and iodine deficient sweat glands produce chronic dry skin. Lack of iodine in the gastric tissues of the stomach results in a lack of stomach acid needed to digest food in the stomach.16 Incomplete digestion of food in the stomach can lead to irritating particles of food in the gut causing inflammation and mal-absorption syndrome. In this condition important elements of protein absorption such as iodine cannot get into the body. Inflammation can also damage enterocytes, leaving less of them capable of absorbing nutrients like iodine, very necessary for protein metabolism. If a person on the Platinum Plus protocol remains iodine deficient, their gut is suffering from mal-absorption. Studies show that protein deficiency causes morphological changes in the gut wall that impedes the absorption of iodine. 17 Therefore there will be immunodeficient patients who will not be able to utilize the iodine they need to fully cure their protein deficiency. In order to address this common problem, I have combined an organic dehydrated aloe powder, concentrated at 200:1 together with organic kelp in order to heal the gut and provide it with an incredible source of plant processed vitamins, minerals, iodine and essential sugars. Sea kelp also helps to nourish the thyroid and pituitary glands, helping to maintain the body’s metabolic balance. These two “Treasures of Land and Sea” provide an incredible boost to the healing process, nourishing and repairing the gut at the same time that the Platinum Plus is working to give you the protein/sulfur you need to rebuild your whole body. 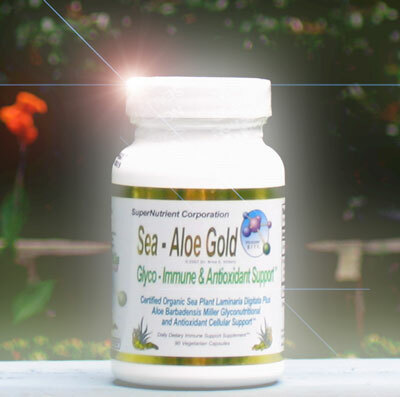 Used together, Sea Aloe Gold and Platinum Plus, as a rule, provide complete healing. Blitz, J.J., Smith, J.W. and Gerard, J.R. (1963), “Aloe Vera Gel in Peptic Ulcer Therapy: Preliminary Report.” /Journal of the American Osteopathic Association/ *62:* 731-735. Langmead L, Feakins RM, Goldthorpe S, et al. “Randomized, double-blind, placebo-controlled trial of oral aloe vera gel for active ulcerative colitis.” Aliment Pharmacol Ther. 2004;19:739-48. Sotnikova, E P., “Therapeutic use of aloe in experimental stomach ulcers”, Sotnikova EP. Vrach Delo. 1984 Jun;(6):71-4. Jeffrey Bland, Ph.D. “Effect Of Orally Consumed Aloe Vera Juice.” Preventive Medicine, March/April 1985. Dr Peter Atherton M.B.Ch.B., D.Obst. R.C.O.G., M.R.C.G.P., “Aloe Vera, Myth or Medicine?” Complementary Medicine Magazine. John Pittman, MD, “The Immune Effects of Aloe” Zhang, L; Tizard, I R. “activation of a mouse macrophage cell line by acemannan: the major carbohydrate fraction from Aloe vera gel.” Immunopharmacology. 1996 Nov;35(2):119-28 Gauntt CJ, Wood HJ, McDaniel HR, McAnalley BH. “Aloe polymannose enhances anti-coxsackievirus antibody titres in mice.” Phytother Res. 2000 Jun;14(4):261-6. Shimpo K, Chihara T, Beppu H, Ida C, Kaneko T, Nagatsu T, Kuzuya H. “Inhibition of azoxymethane-induced aberrant crypt foci formation in rat colorectum by whole leaf Aloe arborescens Miller var. natalensis Berger”. Fujita Memorial Institute of Pharmacognosy, Fujita Health University, Hisai, Mie 514-1296, Japan. Okyar A, Can A, Akev N, Baktir G, Sutlupinar N , “Effect of Aloe vera leaves on blood glucose level in type I and type II diabetic rat models.” Phytother Res. 2001 Mar;15(2):157-61. Chithra P, Sajithlal GB, Chandrakasan G., “Influence of Aloe vera on collagen characteristics in healing dermal wounds in rats.” Mol Cell Biochem. 1998 Apr;181(1-2):71-6. Schmidt JM, Greenspoon JS, “Aloe vera dermal wound gel is associated with a delay in wound healing.” Obstet Gynecol. 1991 Jul;78(1):115-7.